The sin of unforgiveness puts many people on the path to hell. If God can forgive you for your deepest darkest sins why can’t you forgive others for the smallest things? You repent and ask God to forgive you, but you can’t do the same. The things people don’t want to forgive others for are things they have done themselves. He slandered me I can’t forgive Him. Well have you ever slandered someone before? How about the things you think in your mind towards someone when they make you mad. Evidence of true faith in Christ is that your life and way of thinking will change. We are forgiven much so we must forgive much. Pride is the main reason for people holding grudges. There are no exceptions. Did King Jesus hold a grudge? He had every right to, but He didn’t. Scripture tells us to love and forgive everyone even our enemies. Love does no harm and it overlooks an offense. Love does not keep bringing up old conflicts while trying to hide it behind a joke. When you hold on to things in your heart it creates bitterness and hate. God does stop listening to prayers because of unforgiveness. I know sometimes it is hard, but confess your sins, lose the pride, ask for help, and be forgiving. Don’t go to sleep with anger. Unforgiveness never hurts the other person. It only hurts you. Cry out to God and allow Him to work in you to remove anything harmful that is brewing in your heart. Unforgiveness is like taking poison but expecting someone else to die. If God can forgive you for such a huge debt why can’t you forgive others? 2. Colossians 3:13 Be tolerant of one another and forgive each other if anyone has a complaint against another. 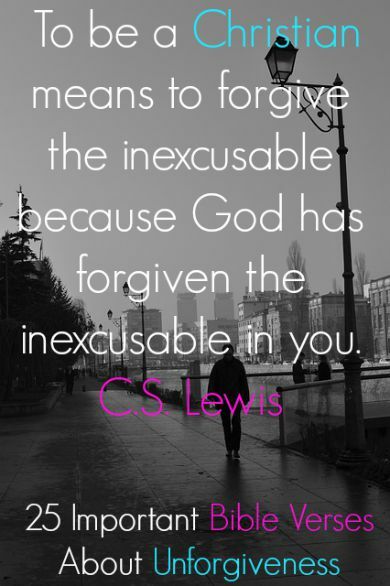 Just as the Lord has forgiven you, you also should forgive. 3. 1 John 1:9 If we confess our sins, He is faithful and righteous to forgive us our sins and to cleanse us from all unrighteousness. 4. Matthew 18:21-22 Then Peter came to Jesus and said, “Lord, how many times may my brother sin against me and I forgive him, up to seven times?” Jesus said to him, “I tell you, not seven times but seventy times seven! 5. Leviticus 19:17-18 Do not bear a grudge against others, but settle your differences with them, so that you will not commit a sin because of them. Do not take revenge on others or continue to hate them, but love your neighbors as you love yourself. I am the Lord. 7. Matthew 5:23-24 So if you are about to offer your gift to God at the altar and there you remember that your brother has something against you, leave your gift there in front of the altar, go at once and make peace with your brother, and then come back and offer your gift to God. 8. Matthew 6:12 Forgive us as we forgive others. Don’t give Satan an opportunity. 9. 2 Corinthians 2:10-11 When you forgive someone, I do, too. Indeed, what I have forgiven—if there was anything to forgive—I did in the presence of the Messiah for your benefit, so that we may not be outsmarted by Satan. After all, we are not unaware of his intentions. 10. Ephesians 4:26-27 Be angry, yet do not sin.” Do not let the sun set while you are still angry, and do not give the Devil an opportunity to work. Leave it all up to the Lord. Unforgiveness leads to bitterness and hatred. 13. Hebrews 12:15 See to it that no one fails to obtain the grace of God and that no bitter root grows up and causes you trouble, or many of you will become defiled. 14. Ephesians 4:31 Get rid of your bitterness, hot tempers, anger, loud quarreling, cursing, and hatred. Unforgiveness reveals how you feel about Christ. 15. John 14:24 The one who doesn’t love Me will not keep My words. The word that you hear is not Mine but is from the Father who sent Me. Unforgiveness is one of the reasons for unanswered prayers. 16. John 9:31 We know that God doesn’t listen to sinners, but if anyone is devout and does his will, God listens to him. When you won’t forgive because of pride. 17. Proverbs 16:18 Pride goeth before destruction, and an haughty spirit before a fall. 18. Proverbs 29:23 Your pride can bring you down. Humility will bring you honor. 19. Matthew 5:44 But I tell you this: Love your enemies, and pray for those who persecute you. 21. Proverbs 10:12 Hatred stirs up conflict, but love covers over all wrongs. 22. Romans 8:13-14 For if you live according to the flesh, you are going to die. But if by the Spirit you put to death the deeds of the body, you will live. All those led by God’s Spirit are God’s sons. 23. Romans 12:2 Do not be conformed to this world, but be transformed by the renewal of your mind, that by testing you may discern what is the will of God, what is good and acceptable and perfect. Unforgiveness has caused many people to go to hell. Is it really worth it? 24. Matthew 6:14-15 For if you forgive others their sins, your heavenly Father will also forgive you. But if you do not forgive others, your Father will not forgive you your sins. 1 John 4:20-21 If anyone says, “I love God,” and hates his brother, he is a liar; for he who does not love his brother whom he has seen cannot love God whom he has not seen. And this commandment we have from him: whoever loves God must also love his brother. Next: Why Does Satan Hate God?